What is commitment but the natural expression of your true desire? It frees you; it does not bind you. It engages you; it does not obligate you. It fortifies you; it does not limit you. True commitment is born of true Knowledge, of which you yourself are born. In this final step in this stage of your preparation, give yourself and your entire day to practice. Honor yourself for accomplishing a remarkable and substantial task in completing this one year of preparation. Honor your Knowledge for giving you the desire to participate and the strength to participate. Honor your Knowledge for giving you the vision that is now emerging. Honor all who have served you in your life—your family, your parents, your friends and your seeming enemies and adversaries. Honor all who have enabled you to value Knowledge and who have given you the strength and the resolve to undertake the preparation for Knowledge. Remember your Teachers as well, for they remember you and abide with you even now. Remember that you are a student of Knowledge, and with this you will be able to proceed forward in your preparation. Today upon the hour and in your two deeper meditation practices, give yourself. Consider all that is given to you. Let this be a day of accomplishment and gratitude. Let this be a day to honor that Knowledge is real in you and that you are real in Knowledge. Open yourself to the next step beyond this program. 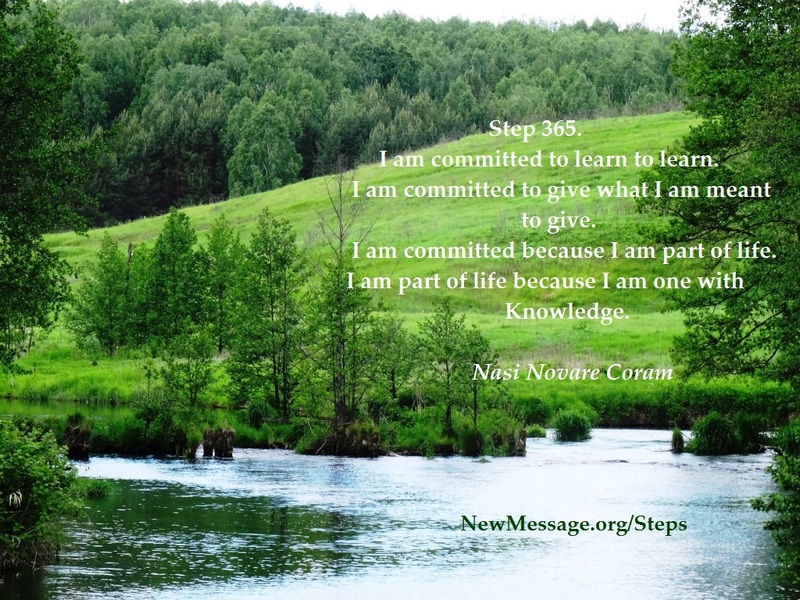 The next step is awaiting you—a step that will meaningfully engage you with other students of Knowledge, a step that will meaningfully engage you with those who have advanced beyond what you have accomplished thus far, a step that will engage you in serving those who are only beginning to advance in the stage that you have just completed. Thus, you receive from those ahead of you and you give to those behind you. Thus, all are nurtured and supported in their return Home to God. Thus it is that you follow and you lead, you receive and you give. Thus it is that all of your activities become uniform and you find escape from all negative imagination. Thus it is that you are a student of Knowledge. And thus it is that Knowledge blesses you who are meant to bless the world. June 21, 2014 Round One: This understanding of commitment is coming through loud and clear as I complete my first time doing Steps. "What is commitment but the natural expression of your true desire? It frees you; it does not bind you. It engages you; it does not obligate you. It fortifies you; it does not limit you." Translating Steps and other NM teachings into Russian is what I feel to be my commitment at present and the place I can give to the world. It is work that frees, engages, and fortifies me, it is not binding, obligating, or limiting. I have been feeling this with greater consistency and depth over the past few weeks as I have been completing my Steps study for the first time and also completing my translation of Part Two of Steps to Knowledge. This has taken priority in my life and has given me a whole new perspective on what is true and necessary for me to do right now. It has taken me longer than a year to do Steps this first time, but I have kept on consistently without abandoning my practice, so I do feel that I have accomplished something and am dedicated to continuing the climb up the mountain. "Honor your Knowledge for giving you the desire to participate and the strength to participate." This is the key for me. Knowledge has indeed given me the desire to participate and the strength to participate and for that I am eternally grateful. It is a great honor and privilege to be willing and able to participate in this mighty undertaking and I look forward to continuing my practice and study. Thank you all here at the New Message from God for your ongoing support, for the strength you pass on, for your light and love, for the immense feeling of community and connection I experience with you. I feel like you are all my family and I have truly come home. I have to admit that completing Steps has been a humbling experience. I felt so empowered and like I was really "getting it" while I was doing them, but now that I have reached the end, I feel as though I am back at the beginning again, and really know nothing. I wish to go through Steps to Knowledge for the second time with even greater dedication and perseverance. This time it took me one year, one month, and 19 days. I meditated today where Greg and I went for our swim. I love the view here. As I stood with eyes open entering stillness, the picture before my eyes seemed to change. I saw an aura around the trees, and the hilly slope in the distance looked like an illusion, as though it were a thin veil. If I walked there I could easily pass through it into another dimension. This confirmed for me that our physical reality is not actually solid and real, it is a figment of our imagination. It is conjured up for our convenience. Beyond the mind is a whole other reality and experience. It contains the Mystery Steps talks about. It is where my Source and Ancient Home can be found. I will go there when the time is right. In the meantime, I have much more work to do. It was hot and sunny all day and then it rained all night. Oh yes, to be ready when we hear the call, that is the true crux of our calling!!! Thank you for this lovely post!